Lottie’s the co-founder of award-winning narrative microstudio Weather Factory, best known for Cultist Simulator. 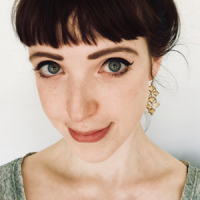 She’s one of the youngest female founders in the industry, a current BAFTA Breakthrough Brit and founder of Coven Club, a women in games support network. She produces, markets, bizzes and arts and previously worked on Fallen London, Sunless Sea, Zubmariner and Sunless Skies as producer at Failbetter Games. Lottie Bevan is one half of Weather Factory, the experimental narrative studio responsible for Cultist Simulator. The studio’s only a year old, but it’s already won start-up awards, launched a #1 game and grossed nearly two million dollars. We also buggered a lot of things up along the way. In this talk, Lottie delves into Weather Factory’s first twelve months, sharing war stories and lessons learned from the studio’s first year of business. She covers the studio’s strategy, how Weather Factory worked it out, and how Cultist Simulator fit into it, as well as their first year’s numbers and how they stacked up against expectation. Lottie shares sales figures, studio costs, our business strategies, publisher stories, and of course our hard-learned lessons. Attendees will learn what worked and what didn’t for a new, small start up with limited funds who don’t even have an office yet. Weather Factory had some advantages over an entirely unknown solo developer, but it’s still a representative example of a humble start-up managing to steer itself to positive cash flow and a bright-looking future. The mistakes we made along the way!